I’m Single….Should I Think About Buying My First Home? 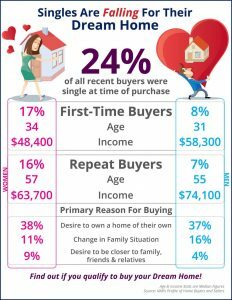 You don’t have to be a couple to buy your first home…24% of all first time home buyers are single! If you are thinking of making the move from renting to buying, now is the time! Talk to your lender, talk to a Realtor and get started on your house hunting journey today! Click the link to check out the current home buying stats and trends.